Wn32 Ver-sur-Mer, La Marefontaine Batterie Vera. A casemated battery of four 10cm guns covering the area of Wn29/31. The area covered by the casemated battery. Plan from the Allied Bigot map of the battery. 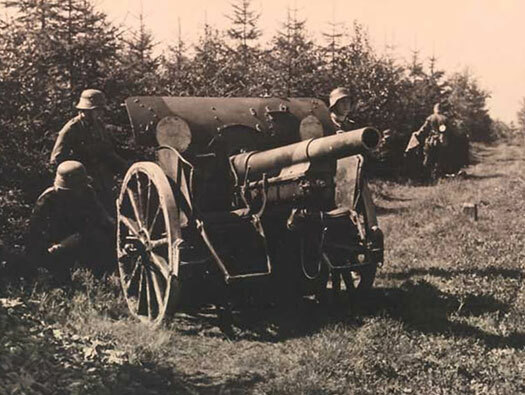 Four 10cm Horse drawn artillery of WW1 period. 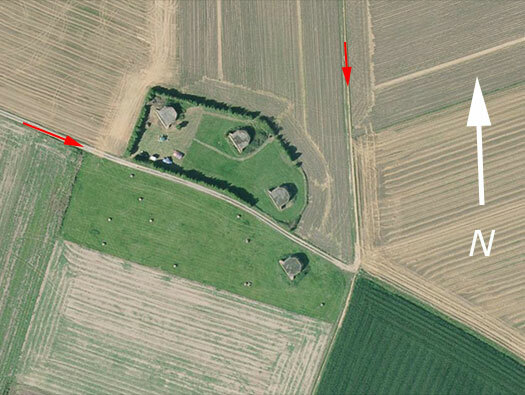 The Allied Bigot plan shows a few bits behind the casemates but the field today is bare. A battery of Hippomobile (horse drawn) artillery. The battery showing how flat it is around here. The German Army map of the area showing where the battery was. This is the one south of the track. A then and now picture. A horse drawn battery, casemated. This battery did fire on D-day. 10cm powder charges in their wooden box. La Marefontaine Batterie Vera. Turm 4 gun room. First there is the half round stops for the guns trail to fit. Then a pit under the gun which I am surmising that it would have been (if its deep) covered in with planking and a hole to allow fired cases to be put so they are not loose around the gunners feet. Or its a shallow pit so that gunners are lower down and covered by the guns shield from incoming shrapnel or rounds? Then the circle that the wheels fit either side and a centre pin that must have fitted into the gun carriage to pivot the gun? Now looking at the back door, you see the pit and the arc of the trail stops. In the corners both sides are tubes allowing the access of command cables. A forward observation officer would have had a place to hide that was quite high up and as there is only two fire control bunkers between Wn08 and Pointe du Hoc so it may have been a church tower? but also may have been an observation bunker on Wn38 Ver-sur-Mer. La Marefontaine Batterie Vera. Turm 4 rear entrance. Some gutters go left and some to the right? La Marefontaine Batterie Vera. Turm 3 rear view. Note the detail, drainage over the door and exhaust vent. Built in Bauform, note the block work with two layers of blocks and steel reinforced bars between them and then back filled with concrete. With Bauform a separate lip around the top has to e added and hooks fitted in to take a camouflage netting. La Marefontaine Batterie Vera. Turm 3 gun room. There is damage to the rear and we were not sure if it was battle damage or a farmer with a large tractors bucket? Extractor fan outlet with a heavy armoured grill and a gutter over the top. Most extractors were removed after the war this is a picture of what they looked like. La Marefontaine Batterie Vera. Turm 3 . Turning circle for the gun. Shell case for a 10cm gun. A drain for water to stop it dribbling into the casemate and nine large holes to allow door fittings in the front. I have never seen doors fitted. A casemate with wooden doors fitted. La Marefontaine Batterie Vera. Turm 3. La Marefontaine Batterie Vera. Turms 2 & 1. La Marefontaine Batterie Vera. Turms 2. This one may be used by the hunters as its very clean and tidy. La Marefontaine Batterie Vera. An extract from a German fire plan map. This is a fire plan of the area for Batterie Vera to use. 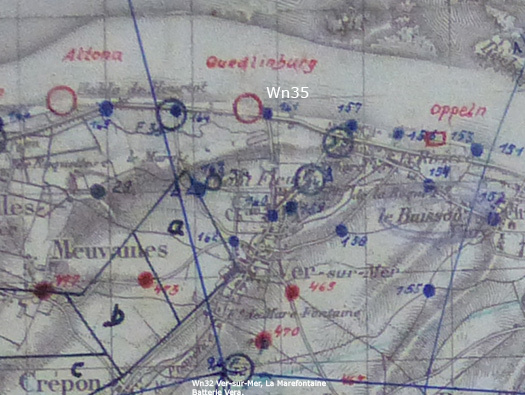 The plan shows the red named circles Attona, Oedlinburg & Opplin are the 6/1716 batterie Vera targets for saturation fire onto a beach landing. The blue circles are other saturation targets and the blue & red dots are point targets, cross roads, areas where bunching up of attacking forces, etc. This fire plan was actually used on D-Day. 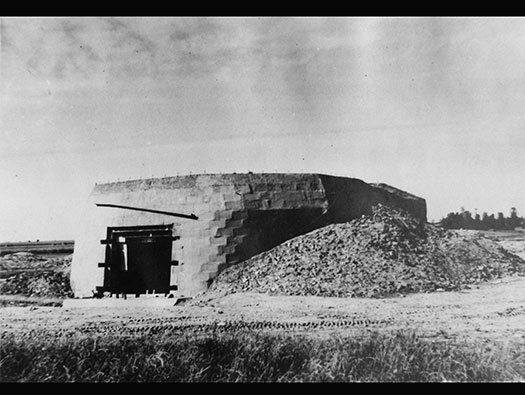 The batterie although heavily bombed between H-30 & H-5 with 500lb & 1000lb bombs fused at 0.025 delay. The casemates and the guns inside were undamaged. All guns fired 25 rounds per gun on D-Day. [Special Observer Party. Beach Report]. This casemate may be used by the local hunters to have their dinner when out shooting. Not the roof ventilation, I have never seen a bar type vents before. Block of concrete. If you know the answer to what this piece did, please can you let me know. La Marefontaine Batterie Vera. Turms 1. Front view. You can see the Bauform block work showing up. Gun room looking towards the back door. Grating over the rear drain. Is this an original grating??? The communication pipe. The tin cover we think is not original and may have been for a BBQ. Gun room. This one is in excellent condition and may have been lived in post war due to a lack of housing in the area after the war. The condition of the internals of this bunker are in very good condition and note the different vents. How the extraction pipes run. A fitting in the roof. Two ammunition Niches either side, one for shot and the other shell. Note the two niches either side at the rear. Belt buckle from a soldier of the regiment. From Fronta.cz. Wooden fittings to take a pipe of some form. La Marefontaine Batterie Vera. Turms 1, 2 & 3. The 7th Battalion the Green Howards landed on Gold Beach at 08.00hrs near the road to Ver-sur-Mer. The beach was under slight mortar fire. 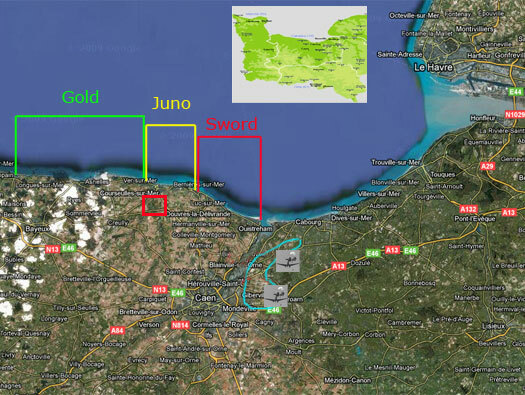 Battalion advanced through Ver-sur-Mer which was clear of the enemy. Halted on the road to Crépon and organized into companies A. B. D. & HQ. 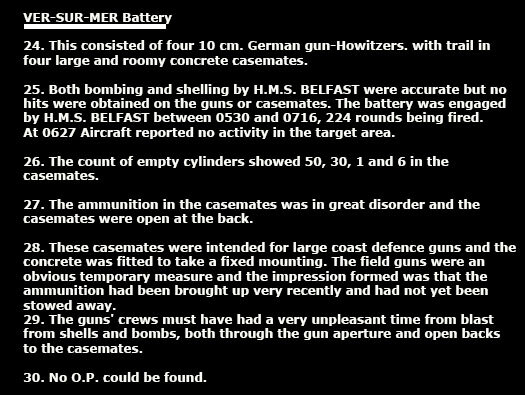 They came upon the Battery of the 6./A.R.1716 which had been under fire from HMS Belfast. 40-50 prisoners were taken. [from the Intelligence/war dairy (WO171/1303) 7th Bat. Green Howards]. Crowded beach landing Gold Beach. La Marefontaine Batterie Vera. HMS Belfast. 52th Division, Tyne Tees landed at Gold Beach, King sector and advanced on Wn32. 50th Div advancing through Normandy. Details from ADM 199-1655 NA & ADM 239-367 ANXCF Report on Operation Neptune - Vol II. La Marefontaine Batterie Vera. .
Around 87 rounds had been fired. 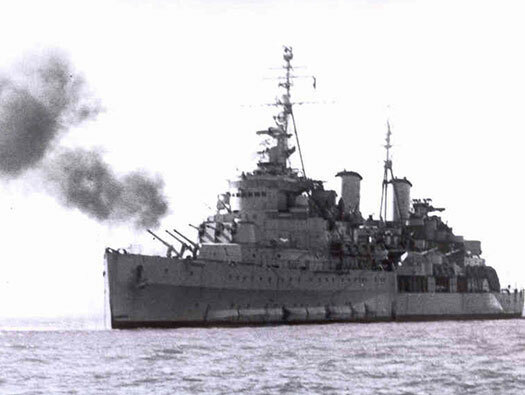 As it says with 224 rounds fired from HMS Belfast, the blast effect would be horrendous. Interesting that no OP was found?? Details from ADM 199-1655 NA. La Marefontaine Batterie Vera. Inside gun room. Was this somebody who lived here.